Discover property for sale in Puerto Rico's popular east coast, where buyers are drawn to the island’s beaches, golf courses, rich history & culture. 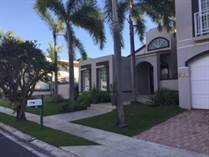 Browse our Puerto Rico real estate listings and explore homes, condos and land for sale on 3,515 square mile territory of the United States. This page includes listings from San Juan, Fajardo, Luquillo, Ceiba and Dorado.